Faro, also known as Pharoah or Farobank, is an old west gambling game of French descent that first showed up in the late 17th century. Although it’s hard to find a game of Faro being played anywhere today, it’s sometimes compared to poker because of their similar qualities of being easy to learn, fast, and having good odds. The reign of Louis XIV is when Faro was first mentioned under the name of pharaoh. It first emerged in Southwestern France several years after basset was outlawed but eventually the French outlawed faro as well. By the 19th century it had spread to the United States and had its name changed to how we know it today, faro. 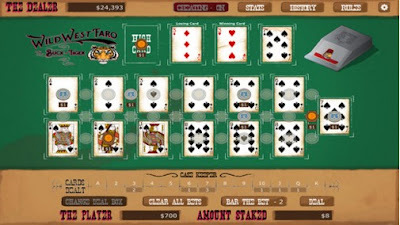 Faro soon became the most popular gambling game especially in the Old West and it could be found in every gambling hall from the years of 1825-1915. What is Wild West Faro? Wild West Faro is one of the best card games that you could ever play. It is an awesome Faro card game app for all Android and iOS users that want to engage themselves in a challenging card gameplay that originates from the Old West. We loved its overall design – the game’s fantastic HD graphics and its entertaining sound effects and soundtrack. Let’s see what does the game offers. First of all, this game’s rules and objectives are based on the classic Faro game. All you got to do is install the game on your device, sit on a Faro table and start placing your bets. You can place bets from $1 to $1 million, use cheats, place a bet on one or multiple cards, use bonus joker cards, break the bank by winning all of the Dealers money, parlay a bet, bet on the high card, and of course – lose or win money. Remember, the money is only not real and the game’s purpose is fun only! With detailed game stats, elegant design and fun card gameplay, Wild West Faro can be downloaded from the following links.